. Published on November 17, 2014 . 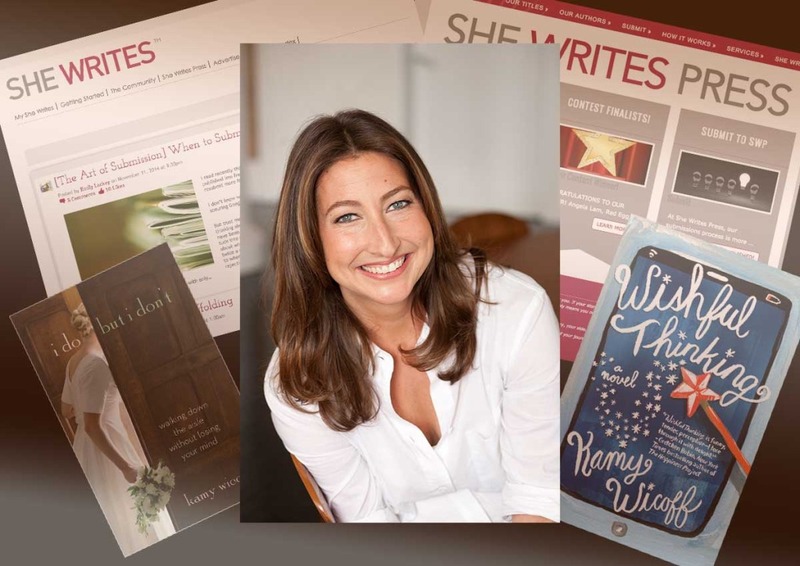 Kamy Wicoff is an author and founding partner of SheWrites.com, a virtual community and marketplace for women who write, and SheWritesPress, a ‘third-way‘ partnership-publishing company combining the quality and high editorial standards of traditional publishing with the higher royalties self-published authors get. Wicoff is the bestselling author of the nonfiction book I Do But I Don’t: Why The Way We Marry Matters. Her debut novel Wishful Thinking will be published in April 2015 by She Writes Press. As a writer who’s leveraged her interests by creating a business to help other writers, Wicoff balances discipline in her writing practice with flexibility in her routines. We were delighted to learn more about the habits that help her make it all happen! What’s your own daily routine like? What habits do you cultivate and what benefits do you find in them? I wish I could say I had more of a daily routine. But as a divorced mother of two boys, there’s my life when my kids are with me, and my life when my kids are without me. When my kids are with me, I write during the day while they are at school; when they are without me I’ll hit the gym and then work late into the afternoon. I can’t write at night—I can count on one hand how often I have done that, and only under the gun! In terms of habits, I do reread my writing from the day before whenever I sit down to write again, and generally spend about an hour revising before moving on to the new stuff. It helps orient me to where I am in the story and establish flow. As a rule I edit a lot while I’m writing, and generally produce a very clean first draft as a result, though it takes me longer to get through initially. The most common advice we hear about writing habits is simply to write every day. But what’s your best advice for overcoming procrastination and getting quality work out of your time spent writing? A friend of mine told me at one point, when I was complaining about not having enough time to write, that I was underestimating how powerful and effective I could be if I wrote even for only an hour. I had always thought that if I could only find an hour, there wasn’t any point to it (see earlier bit about how I always start by revising what I did the day before), but when I really absorbed that, it freed me up a lot, in large part by making me feel less anxious when my schedule got thrown off unexpectedly. I don’t write every day, but I do set deadlines for myself — mostly goals about when I want to complete a chapter or a section of the book. That helps me to stay on track and forces me to balance my perfectionism with the need to get the words on the page. Are there any habits you’re trying to develop now? What motivated you to work on them? Right now I’m in an awkward in-between stage, having finished my novel but not yet having started the next project. I’m trying to get in the habit of working on shorter pieces—essays or magazine-length stuff—with the discipline I apply when I’m writing a book, but I’m finding it hard because I don’t have the direction and focus I have with a longer project. I’m not waking up thinking, “Okay, my characters have to do X today, time to sit down and make it happen.” Instead I’m thinking, “What should I work on first?” So I’m trying to get better at prioritizing and not losing my focus. Who or what inspires you? Whose habits would you like to know more about and why? I am incredibly inspired by my good friend Gretchen Rubin, who has a work ethic like you would not believe. I especially admire Gretchen’s ability to be online engaging actively with her community without letting it derail her from her writing projects. I struggle with that balance at times with the online community I founded, SheWrites.com, and my own writing, and I actually took a year-long hiatus from blogging at SheWrites because it was so hard to be “on” there and also immerse myself in the novel the way I needed to. I also hugely admire my partner in founding She Writes Press, Brooke Warner. Brooke has the most intense work ethic of anyone I’ve ever seen—she is routinely awake, talking to our authors, before I am, and she lives on the west coast and I’m on the east! Brooke found a way to start a new business, with an entirely new business model for publishing, while still doing her “day job”, something I think a lot of entrepreneurs have to manage in the early days of a new venture. Brooke never feels sorry for herself or blames others when she’s overwhelmed. Instead she is straightforward about it with everyone around her, takes responsibility, and makes things right. I respect that so much. #500WED: a community challenge to fall in love with writing again. Can you write 500 Words Every Day for a month? Write for 30 minutes: a timed practice of writing each day. Set Priorities for Your Day: Make sure you get things done that will make you feel good about your day. Terrie Schweitzer is a consultant and writer living in Northern California. More at terrie.me.